As part of Toshiba’s 25th Anniversary of “Laptop Innovation”, they recently announced the Libretto W100, a dual screen mobile PC with an ebook reading twist. So is this Toshiba’s jump into the ereader market? Hardly. But they do list ebook reading as one of the Libretto’s features and even demo it as an ebook reader in the video below (just don’t hurt yourself laughing at the music). The ebook part of the demo is at the 37 second mark on the video. The Libretto runs Windows 7 Home Premium so it has the whole gambit of ebook reading apps available for it. 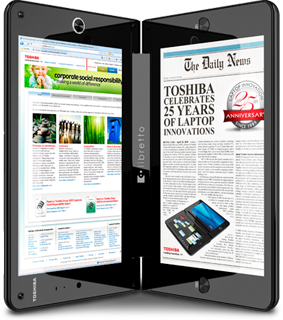 Its unique dual screen design features two 7-inch screens that when held vertically, the device functions as an ebook reader that displays a double-page spread, as described by Toshiba. They also use the phrase “perfect for ebooks” on the device’s main page. While that remains to be seen, looking at the specs the device’s main drawback is the battery life. It’s a pathetic 2 hours with the standard battery pack and 4 hours with the “high-capacity” battery pack. Not sure how popular a “ultra-mobile concept PC” is going to be with a battery that doesn’t last any longer than the average laptop. Another key feature mentioned in the press release is that the multi-touch screens can work independently or together, displaying separate programs or the same page across both screens. The device also has a 3D accelerometer built-in. The Libretto W100 is slated for a limited release later this August from select retailers and direct from Toshiba at toshibadirect.com. Update: The Toshiba Libretto W100 is now listed on Amazon.com for a whopping $1100! Doesn’t look like we’ll be doing a review any time soon at that price . . .
Is Sharp Working on a Solar Powered eReader?